Julian Assange and his pet project, WikiLeaks, have been all over the news recently, their release of secret documents related to the Iraq War certainly stirring up a hornet’s nest. Prior to this point, the website was celebrated, and not just by a bunch of “black hat” hackers either. 2008 — Economist magazine New Media Award. June 2009 — Amnesty International’s UK Media Award ( “New Media” category) for the 2008 publication of a report by the Kenya National Commission on Human Rights about police killings in Kenya. May 2010 — the New York Daily News listed WikiLeaks first among “websites that could totally change the news”. First, the U.S. government pushed WikiLeaks off the servers of Amazon, its U.S. host — thanks in part to an effort by the office of Senator Joe Lieberman, who heads the Senate Homeland Security Committee. After the rogue site was pushed off a smaller, backup host in the U.S., it moved first to a Swiss domain, then to a simple numeric one. WikiLeaks has complained, and some news outlets have reported, about apparent hacker attacks against the website. The effect of all that pressure, however, was very much like cutting the head off the mythical Hydra. By Tuesday evening, WikiLeaks listed 507 Web addresses that it said were hosting the site worldwide. Since then things have escalated. PayPal, MasterCard, and Visa all blocked the flow of funds to WikiLeaks, which is when Operation Payback has resurfaced and the DDOS attacks began. I was watching online as one after another of the three of these financial sites were crashed within mere seconds of the attack’s announcement on Twitter. At the same time, similar denial of service attacks were made on the Swiss bank PastFinance, which had earlier frozen Assange’s account. Then the front lines shifted to Twitter and Facebook. Anonymous, the group behind Operation Payback, was using these two platforms to organize its efforts. Facebook is generally resistant to requests by the governments or advocacy groups to take down material if that content is not illegal or does not violate Facebook’s terms of service. (The Facebook TOS prohibits attacks on individuals or incitements to violence.) Twitter has long trumpeted its role in free speech and political protest, both of which are integral elements of the current equation. Facebook banned one of the group’s pages in fairly short order saying that orgainizing a DDOS attack violates its terms of service. (An interesting note: while it took down the Operation Payback page, the WikiLeaks page, which did not encourage the attacks, is still active and online.) Twitter left the Operation Payback account live until mid-afternoon Wednesday, when a tweet was sent from that account linking to a file purportedly containing thousands of credit card numbers (according to Ashley Vance of The New York Times). I’m sure that by the time this is published tomorrow morning, there will be additional developments — more online skirmishes in this ongoing war. What I think is most important is its status as the first true infowar. While Operation Payback is seemingly composed of a large number of people, it is not an actual organization in the traditional sense. Amorphous and anarchic in nature, it has stated its avowed purpose as bringing down those who obstruct freedom of information. Decentralized and unpredictable, it has no definable structure that others can combat. This war is between factions on the Internet, and both sides are playing dirty (WikiLeaks has been subject to repeated DDOS attacks over the past seven days as well). On one side are the goverments and corporations involved, on the other, a crowdsourced affiliation of the WikiLeaks supporters. These documents are out there now. There is no way to reel them back in. This is a fact of life. Even if Assange decided to take everything offline there is no way to remove it from file-sharing applications and independently run mirror sites. There is no precedence for this. The Pentagon Papers seem to be a reasonable comparison, but it really is not. You see, they were leaked in the days before the massive amplification factor of the Internet. I’ll say it again, this is completely unprecedented. We are watching history being made, for good or ill. To make it even more confusing, there is so much obfuscation obscuring the story, hardly shocking considering hackers are involved. We would love your thoughts and opinions on this subject, leave us a comment! UPDATE: It seems that while Amazon is more than willing to pull its server space from WikiLeaks, it is also profiting off of the situation. As this was going to press, I discovered that it is selling the leaked documents in a Kindle edition. The product description starts with: “The batch of 250,000 US classified documents released by WikiLeaks to several news outlets, some of whose content was made public Sunday, sheds new light on the sordid nature of American imperialist intrigue and conspiracy around the globe.” I’ll let you reach your own conclusions about that. 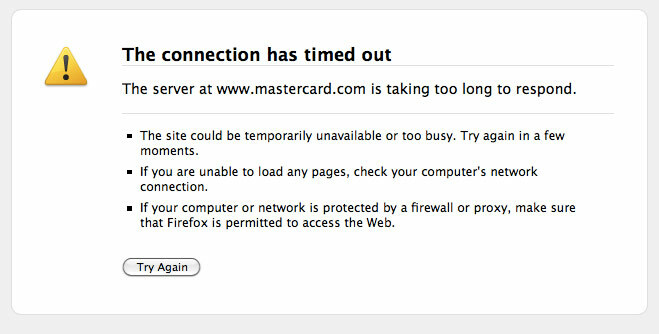 Image: Screencap from MasterCard.com, 12/08/10, used under Fair Use: Reporting.